I have an idea for a light-strategy, area-control game currently called "Mole Majority." As you might guess from the title, players compete to be the group of moles that occupies the most territory within a golf course, while dodging groundskeepers and resisting conversion attempts from a rival mole tribe. The game is scalable intended for 2 to 4 players, and playtime is roughly 15 minutes per player. Territory/area control, non-contiguous. Players earn points for territory they control. Territory does not need to be linked together, or connected. Light Strategy. Plays in less than an hour. Direct Interaction. Players can directly affect their opponents cards, pieces, and territory in various ways. Non-violent. I want competition, not combat. This keeps the theme lighter and the audience broader. The following comprise the current iteration of components as well as a summary of gameplay. The players begin the game by shuffling the hex tiles face-down, then building a hexagonal assembly: a hex tile at center, then a ring of six more tiles around that. Each player places their six-point "home base" hex and two randomly-selected hexes to finish assembling the game board. 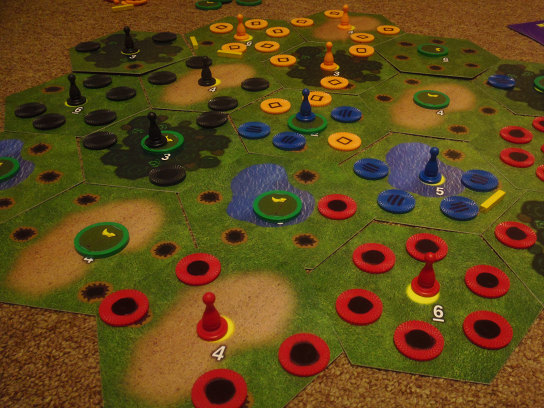 Each player's home base is then filled with their own Mole Tokens, the rest of the hexes are topped with a green Homemaker token, then play begins. MOVE or BREED (numbered 1 through 4): place that many mole tokens on a hex or hexes you already control OR onto hexes next to a hex you already control. GROUNDSKEEPER: play an additional numbered card and remove up to that many moles from a single hex. Moles must be adjacent (next to one another on the same hex tile). Groundskeepers remove only moles, not claim tokens. 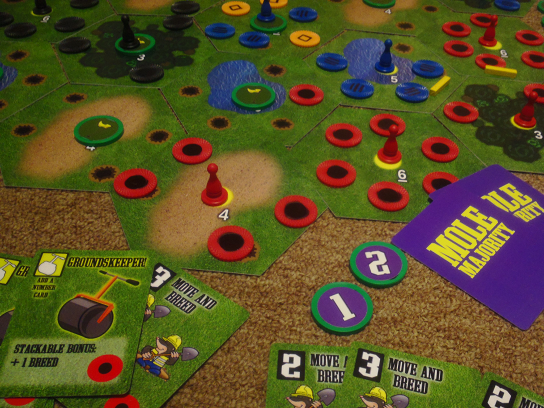 Players may have a Groundskeeper roll over a hex where their own moles reside, and may remove their own if required. CONVERT! : remove an opponent's mole from anywhere within your Tunnel Network, and replace it with your own. If the hex is full after doing this, immediately re-assess Majority (who has Claimed this hex). This ability can be activated through Cave-In barriers. Additionally, this is a stackable +1 Card that allows the player to do an additional Move, Breed, Groundskeeper, or Convert action on their turn. CAVE-IN: this builds two barriers at the edge of any hex(es) controlled by the active player, so that moles cannot cross from one side to the other at that edge. The player causing the Cave-In takes one Home Token at random from those not used on the board. MAKE A HOME: A player can Make a Home in a hex they currently have claimed to take the green Home Token from the center of that hex. At the end of the game, the number listed on the face of that hex is awarded to the player. If anyone has feedback on this (currently in the seventh or so iteration, and ready to be seen by publishers), please let me know. Have a look at the numerous playtesting reports to see the notable progress Mole Majority has experienced. I've learned a fair amount in this process, and certainly have enjoyed myself. Love the way this has come along.